Hello! Yet again, we have launched a survey on password usage behavior. As our previous survey went like a breeze (you will find the report in our archives), it is a logical next step that we decide to try one more time. From the very first survey we gained curious info, which was also interesting to publicity. Naturally questions about password protection are numerous and some of them remain dark, possibly a little too much so, that is why we are tempted to undertake one more “investigation”. This time we expanded on questions and made some of them hypothetical, where you are put into a situation to find a way out. It is interesting to trace your way of thinking on both hypothetical and actual matters, so other questions are suggested to understand your attitude to real everyday situations you have to deal with. As usually, survey completion will be finalized by a report. 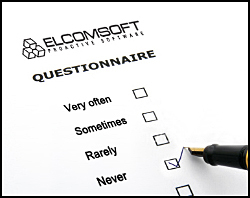 We tried not to inundate our questionnaire with baffling questions, but if you still consider it time-consuming, you are welcome to answer one absurdly simple question on home page of ElcomSoft website. C’mon you are within an ace of getting 10% discount for all our software; just find a little will-power to put a couple of ticks. Again, thank you for taking time from your busy day and completing our questionnaire. And feel free to channel this survey to your friends and colleagues.